May be used ahead of repair treatments. POLASEAL PENETRANT HARDENER is a unique water-based polymer especially designed to penetrate and restore strength to masonry surfaces. Applied directly to the substrate, Polaseal Penetrant Hardener chemically strengthens concrete, mortar, block, and other masonry materials. 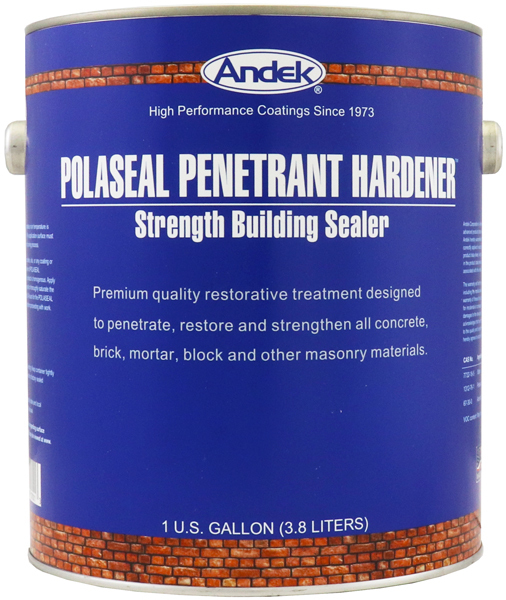 POLASEAL PENETRANT HARDENER is a premium quality restorative treatment for concrete masonry materials. It is a water-based solution of soluble polymeric silicates designed to be totally compatible with concrete masonry. When applied to a masonry substrate, POLASEAL PENETRANT HARDENER penetrates and deposits its polymeric silicate active ingredients. Two simultaneous reactions occur: first, the silicates react with free lime in the substrate to form a stable calcium silicate structure. Second, remaining unreacted silicates fuse together to add additional strength. POLASEAL PENETRANT HARDENER will almost always add some strength improvement, even to new concrete. The amount of physical improvement will vary from case to case, depending on the porosity and chemical makeup of the substrate. The physical strength change after treatment may vary from mild improvement to dramatic improvement. A test application is always recommended to determine the effect of treatment in advance. Can be used over concrete, stucco, mineral composites, bricks, masonry, porous stone and other surfaces. The substrate must be dry, clean and free of loose particles, oils, or any coating or substance that would interfere with penetration. Open a new container of POLASEAL PENETRANT HARDENER and stir for 1 minute to be sure that the product is homogenous. Apply the material by brush, roller or spray technique. Apply enough material to thoroughly saturate the surface and to insure that penetration is taking place. Allow at least 24 hours for the POLASEAL PENETRANT HARDENER to dry and for initial cure to take place before proceeding with work. POLASEAL PENETRANT HARDENER is designed to be used ahead of repair treatments, such as patching, parging, plastering, painting, repointing, or waterproofing. POLASEAL PENETRANT HARDENER does not waterproof; therefore, it will not interfere with the bonding or penetration of repair materials. POLASEAL PENETRANT HARDENER will tighten and strengthen a substrate to greatly improve the performance of repair coatings. For spray applications, use HVLP spray equipment. Protect product from freezing. Do not apply to frozen surfaces. Do not apply unless the temperature can be maintained above 40°F for 24 hours. Application must be protected from precipitation for at least 12 hours. Shelf life is 24-36 months when stored in tightly sealed containers. POLASEAL PENETRANT HARDENER may cause a mild white staining on some substrates. This is not efflorescence and it is not damaging to the substrate or the effectiveness of the product. The staining is caused by a reaction with carbon dioxide in the atmosphere and the alkali component of the product. This produces a small amount of white alkali carbonate by-product that can be washed or brushed away.